While Hanauma Bay is hands-down my favorite snorkeling spot on Oahu, there are a lot of great places to go snorkeling here. It just depends on what you are looking for and what else you are doing that day. 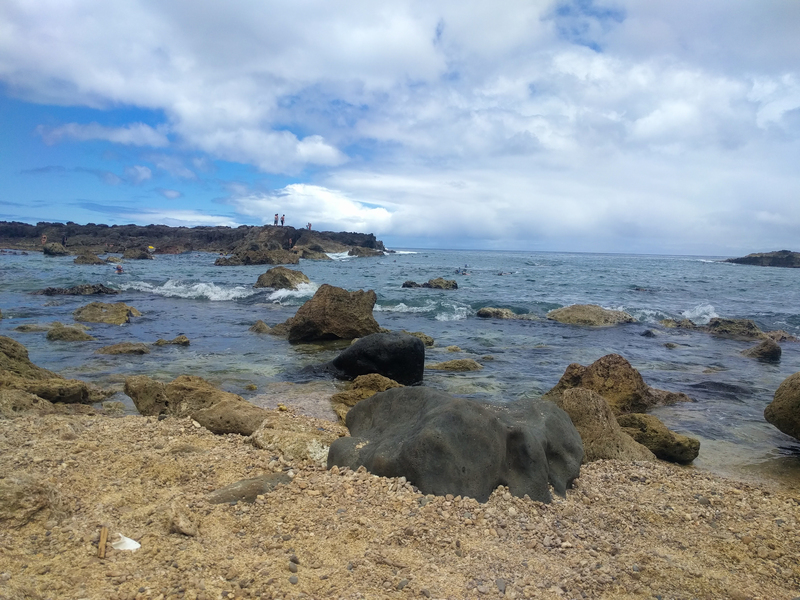 For those who are staying on the North Shore, or who plan to spend the day up there, Sharks Cove is a great option for snorkeling. The beach is gorgeous, the water is crystal clear, and there are lots of great food trucks right across the street. The North Shore is my favorite part of Oahu. It is much more laid back and much less developed, with a lot fewer people. The beaches are usually less crowded, and there are lots of fruit stands and local places to eat. I like to bring people up to the north shore for the day, and we usually end up exploring beaches that look secluded, getting coffee, and watching the sunset. My recommendation to snorkel at Shark’s Cove comes with one caveat: The summer months are the only time you can snorkel at Shark’s Cove because the waves are much calmer. In the winter months, the swell rises. Between the giant waves and strong current, you should not swim in Sharks Cove in the winter months. Check weather and tide conditions before you go, no matter the month. And don’t let the name scare you. Sharks Cove is a lava rock beach that got its name because the rock formations look like a shark when you look at it from above! I like to get to Sharks Cove early in the morning, around 9:00 am, to beat the crowds and get a good parking spot. 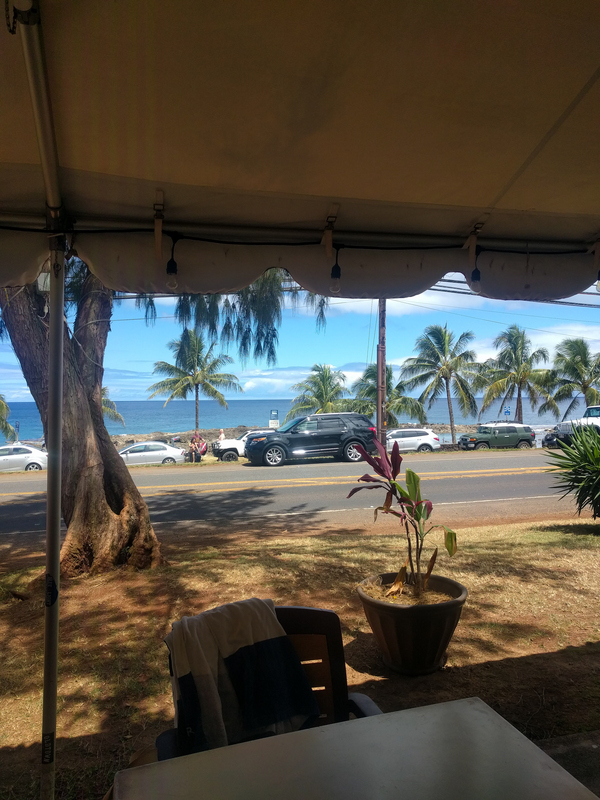 I usually snorkel for an hour or so, lay out on the beach, and get some lunch at one of the food trucks next door. And to me, that is a day in paradise well-spent! Check out that crystal clear water! 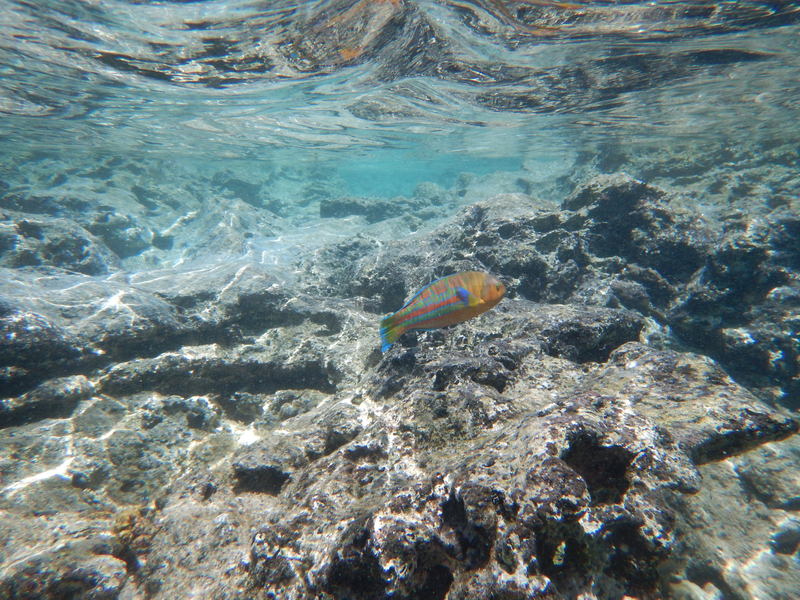 Look for the rainbow wrasse when snorkeling at Sharks Cove - this brightly colored fish is my favorite, and there's lots of them here. There are a few different parking lots available. Some of them will be a bit of a walk to Shark’s Cove, but it’s manageable. The parking lots are great, but they do fill up quickly. Get there early in the morning to ensure that you get a spot. No matter where you go on the North Shore, it gets very crowded on the weekends. Because there is only one highway – and it’s a one-lane road – for the entire north shore, there is usually a lot of traffic up there on the weekends, too. It would be best to plan to visit Sharks Cove during the week. Bring sunscreen, a bathing suit, a towel, money for your snorkel gear rental and lunch, and some sun protection for snorkeling, like a rash guard. It’s very rocky on the beach and getting into the water. The rocks can hurt your feet, making it hard to get into the water. Wearing reef shoes is a good idea because it will because of the sharp coral reef that is everywhere in the cove. The rocky coastline at Sharks Cove is beautiful, but it isn't the best spot to lounge around. 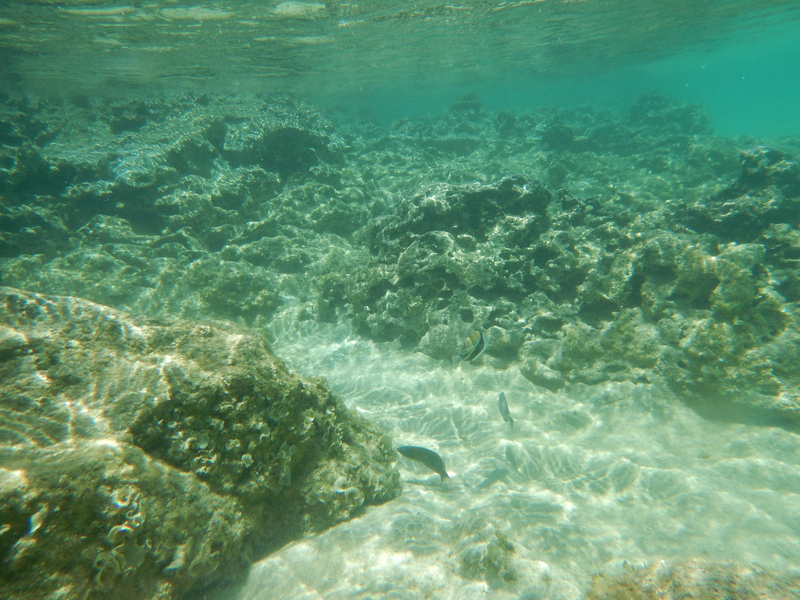 The water is very shallow, which is great for snorkeling and kids. In some cases, the water is almost too shallow to snorkel in, so be aware of your surroundings and always check tides and current conditions. A shallow area of Sharks Cove. If you’re going to go to Shark’s Cove, you might as well make a day out of visiting the North Shore. Check out our guide to finding the best hidden gems on the North Shore. Although there is no safety video to watch here like there is at Hanauma Bay, the same safety advisories and laws protecting marine life apply. All visitors are required by law to refrain from mistreating the marine animals. Don’t touch or harass them. Hawaiian green sea turtles and monk seals are endangered – click here for more information about keeping them safe. There is no rental place on the beach, but there are a few places that rent snorkel gear directly across the street. You can’t miss them. Also across the street are many different food trucks to choose from. From the street, it looks like there are only a few. But if you walk around and behind some of them, you will see a lot of different options available. I found this food truck tucked way behind all of the others. Don't be afraid to do some exploring! restaurants on the island, you pay big bucks for a nice water view with your meal! 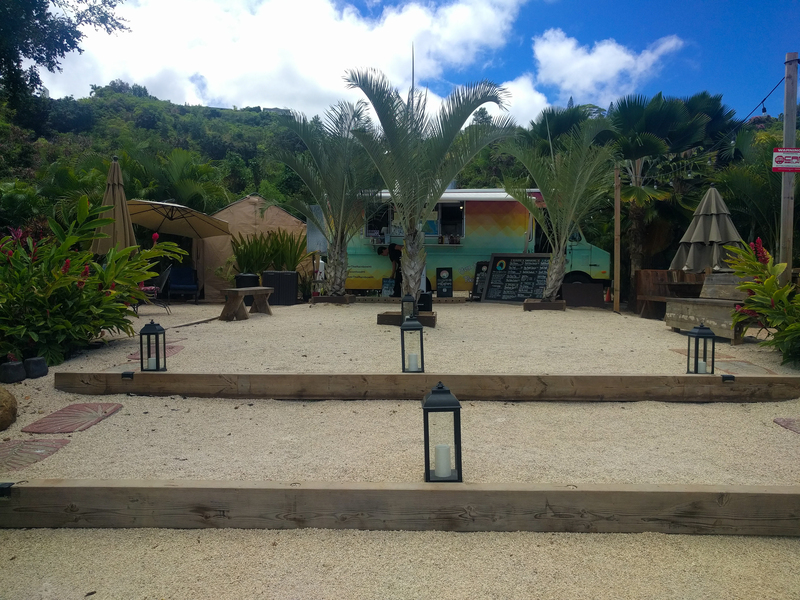 The best part about eating lunch at the food trucks at Sharks Cove is the view!